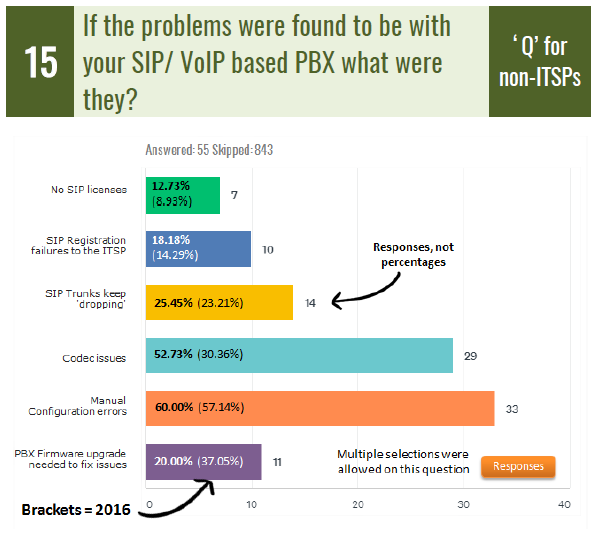 SIP trunk problems often arise on the PBX and SBC equipment side, as The SIP School’s 2017 SIP Survey shows. Every year I optimistically think SIP trunking will finally mature and become a commodity implementation, as I mentioned in my post last week, "SIP Trunk Provider Report Card." SIP trunking has been maturing in terms of sales and number of installations, but it's still lagging behind maturity when it comes to successful implementations and the reduction of problems. I've followed The SIP School's annual SIP Survey for many years now, and it's interesting to see the same problems continue to surface year after year. As the 2017 SIP Survey results show, SIP trunk providers are the culprits in most of the implementation problems. While last week I looked at the survey results for SIP Trunk Providers, this week I'll turn to evaluating the equipment (SBC and IP PBX) vendors and the issues associated with these products. The data and charts in this blog are from the SIP Survey 2017, which gathered responses from 895 professionals. The results demonstrate that while we are not experiencing new problems, we are repeatedly experiencing the same old problems. 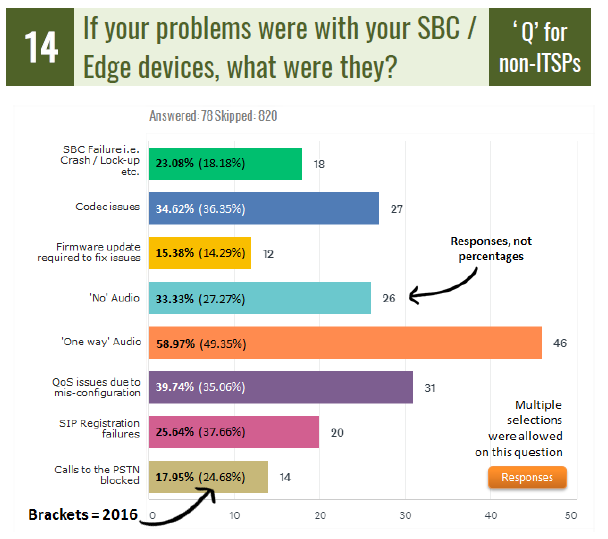 The SBC and edge devices are the second most common source of implementation problems for SIP trunks, with 20.15% of the problems associated with this equipment. This is an improvement from the 2016 survey, for which 23.51% of the problems were found to be associated with the SBC and edge devices. It is satisfying to see some problems decrease in occurrence frequency, but the other problems that have grown in frequency year over year appear to signal that these equipment vendors still have lessons to learn and functions to correct. As I mentioned in my last blog, the survey also asked questions of providers, or ITSPs. When asked what problems they observed, ITSPs reported that the SBC and edge devices accounted for 38.86% of issues and PBX vendors accounted for 47.29% of the problems. The service provider reported on themselves that they contributed 7.53% of the problems. When I look at the disparity between service providers and equipment vendors problems as reported by customers, I wonder who is more accurate? I speculate that the problems as reported by the customers and the problems reported by the ITSPs are correct, but I question the accuracy of their quantitative reporting. The numbers just don't match. There are five possible sources of problems: the provider, PBX vendor, SBC vendor, VAR or reseller, or the customer itself. Every year the survey asks customers how they rate the involved parties. The customer is always left out of the survey. If we look at the ratings below we find that the PBX vendor and the SBC vendors are reasonably close in their ability to support the products and fix problems. Both the dealer/reseller and the hosted VoIP provider are considered to be of poor assistance in resolving problems, and resellers need more education. Talk to all parties involved before implementation. Get case studies from ITSPs and the vendors. Do not start on SIP trunking until you have performed a network assessment including analysis of VLANs and L2 QoS configurations. Ask ITSPs to respond to your business requests and determine if they can offer and support everything you need: Service-Level Agreements (SLAs), small sites in the remotest of locations, and international locations. ITSPs should let you trial SIP trunking for free for up to 30 days. There may be five providers when you start looking, but through mergers and acquisition you could end up with two or three providers. Look into this possibility when you create your provider selection list so you can be prepared. Join Gary at Enterprise Connect 2018, where he'll be presenting in the session, "Trends in Session Border Controllers: Virtualization & Security," taking place Tuesday, March 13, at 8:00 AM. If you haven't yet registered for Enterprise Connect (March 12-15), register now using the code NOJITTER to save an additional $200 off the Advance Rate or get a free Expo Plus pass.